« Phil Blankenship’s Film Explosion Part 2 @ The New Beverly Cinema! TUCKER & DALE Vs. EVIL is the THREE’S COMPANY of gore-comedy! I went to a sneak preview last Saturday night at The Cinefamily of a hilarious new situation-gore-comedy that has killed audiences at both Sundance and SXSW, called TUCKER & DALE Vs. EVIL. It’s about two perfectly likable good-ole-boys named Tucker (ALAN TUDYK) and Dale (TYLER LABINE) who have just inherited a creepy old shack in the woods that they plan on turning into their dream vacation home. A group of partying college kids mistake the lovable bumpkins for deranged hillbilly psychopaths when their friend Allison (KATRINA BOWDEN) is knocked unconscious and the boys carry her off to their cabin for aid. The splat-stick style violence ensues as the coeds begin accidently killing themselves, while trying to take back their pal from the innocent rubes. It keeps building and compounding on the misunderstandings and the gore, making it all play like a mix between THREE’S COMPANY and THE TEXAS CHAINSAW MASSACRE. The performances by ALAN TUDYK and TYLER LABINE as Tucker and Dale are top notch funny and they both share a great chemistry together. The gore gags are extreme, but very comic and the mix of horror and comedy hasn’t been this good since SHAUN OF THE DEAD. I loved it and thought it was the most consistently funny movie I’ve seen this year! After the screening, there was a Q & A with Tucker himself, ALAN TUDYK. He talked about filming the movie up in Canada and how director ELI CRAIG encouraged he and costar TYLER LABINE to play the situations as real as possible. TUDYK said he loved working with LABINE and the two hit it off instantly. He credits the film’s comedic strength to a great script from ELI CRAIG and MORGAN JURGENSON. TUDYK took questions from the crowd and none other than NATHAN FILLION (SERENITY, SLITHER) asked him about his comedy technique. Then FILLION took the stage with his former FIREFLY costar and the two friends went off on a hilarious and very self-deprecating discussion on comic acting. It was a real treat for everyone in attendance. 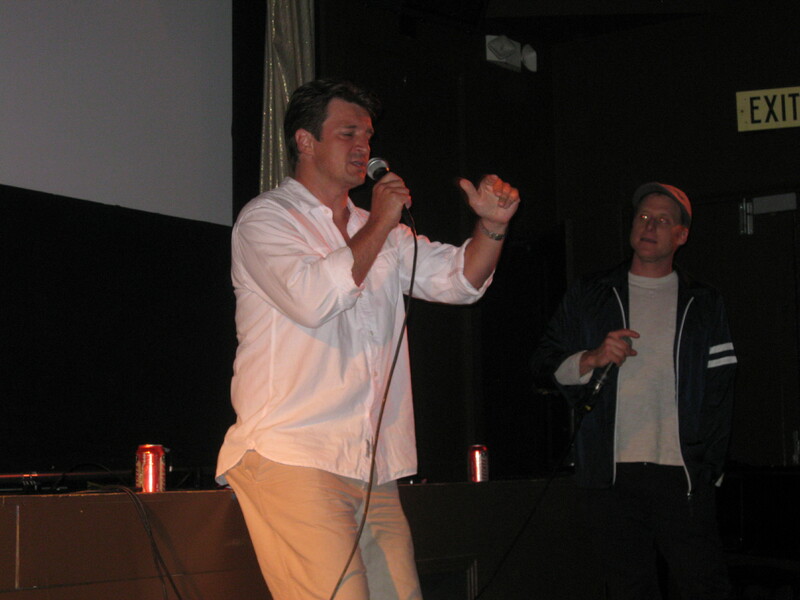 Nathan Fillion and Alan Tudyk discuss acting and humor. The sad news is: TUCKER & DALE Vs. EVIL doesn’t have a theatrical distributor yet. As funny and awesome as it is, the producers have not raised enough money to release and market it properly, so it might just get dumped on DVD like TRICK ‘R TREAT. It only cost about 3 million to make, but 10 million is what it takes for distribution and they’re about 3 mill shy. I hope they get it because this movie deserves to be seen with an audience and I think, if given the chance, it could be a big hit. It’s a great gore-comedy in the vein of EVIL DEAD II, DEAD ALIVE and TREMORS and I hope everyone gets a chance to see it soon. Nerd out! This entry was posted on June 19, 2010 at 1:30 am and is filed under Uncategorized. You can follow any responses to this entry through the RSS 2.0 feed. You can leave a response, or trackback from your own site.